It is believed that only the juveniles are found in brackish water while the adults are more solitary and swim out to the coral reefs to breed. 20,000-150,000 eggs are laid. Only a few reach maturity in 1-2 years. Young fish have iridescent yellow patches on their upper body between the dark bands, which perhaps helps them to school together in the muddy waters. As they get older, patches disappear and the black bands get shorter and eventually only seen on the uppermost part of the body. Archers belong in brackish water, a fact that is often overlooked. Their preferred environment consists of warm brackish water, which limits tank mates to other brackish fish. 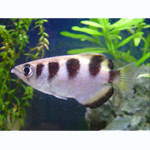 Possible tankmates include other Archers, Scats, Monos, Knight Gobies, and Puffers.